Yogyakarta – Tuesday, January 29, 2019, the Doctoral Program of the Faculty of Economics and Business, Universitas Gadjah Mada held an open defense of Syaiful Iqbal, S.E., M.Si., Ak., CA., CPMA., a lecturer of Faculty of Economics and Business, Universitas Brawijaya. 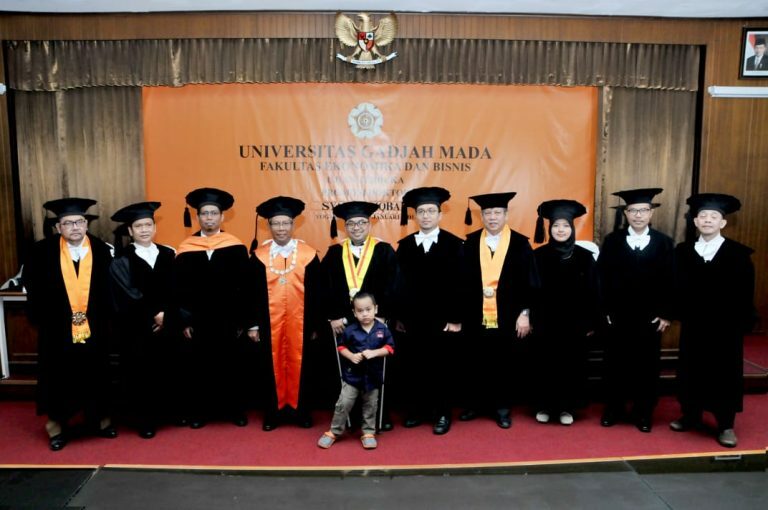 Dr. Syaiful Iqbal successfully achieved the 263rd doctorate at Faculty of Economics and Business, Universitas Gadjah Mada and the 4326th doctorate at Universitas Gadjah Mada. He was a doctoral student of the Doctoral Program of Accounting at FEB UGM who passed a satisfying predicate. His dissertation entitled “Interactionist Effect of Cognitive Moral Development, Tax System Implementation, and Prior Audits on Tax Compliance ” were promoted by Eko Suwardi, M.Sc., Ph.D., Prof. Mahfud Sholihin, M.Acc., Ph.D., and Supriyadi, M.Sc., Ph.D. Furthermore, the examiner team in this doctoral promotion were Sony Warsono, MAFIS., Ph.D., Prof. Jogiyanto Hartono M., Ph.D., Dr. Efraim Ferdinan Giri, M.Si., Prof. Indra Bastian, Ph.D., and Dian Kartika Rahajeng, M.Sc., Ph.D. The results of his dissertation have two main contributions. First, from a theoretical perspective, this dissertation has expanded the scope of the application of cognitive moral development theory into the taxation domain. Second, from a practical perspective, this dissertation can be used as a reference for taxation authorities related to tax compliance. Through this dissertation, it is also expected that the tax compliance puzzle can be solved.